Your spring cleaning is done, but why does your living space still feel tired? Sometimes it takes more than a deep clean to get rid of that sense of dread, especially when you want to feel re-energized and motivated by your space – and what better opportunity than the beginning of a new season? You know the drill coming out of winter hibernation: With each room you go into, the list grows. Your office could use some repainting. Has the grout in the bathroom always been THAT dirty? And of course, it’s certainly easier to stop using the broken garbage disposal instead of dealing with the back-and-forth of getting it fixed. When there are projects all around you but you don’t have the time (or energy) to address them, that’s where Fixer steps in… and like magic, all is right with the world. With easy booking and concierge-style service that allows you to pick the day and time that works for you, we’ll help you tackle your long to-do list and freshen up your rooms. Here are a few examples of renovations or repairs that Fixer can help you with, all at the tap of a button. There is no more well-worn room in the house than the kitchen. Everyone is congregating in there all the time, even between meals. The cabinets are grimy from grease, your faucet hasn’t been replaced since you moved in 10 years ago, and that one loose backsplash tile continues to be the bane of your existence. Now imagine walking into your kitchen and feeling… calm. Light. Relaxed, even. Instead of worrying about your cabinets, you can decide what the fam will have for dinner tonight without the added stress. Fixer can take care of those projects, big or small. We’ll clean your cabinet grease and make sure the hinges are on tight, update your sink fixtures or kitchen backsplash, and even fix that horrible grinding sound your garbage disposal’s been making for the past six months. After a long day at the office, you just want to come home and chill on the couch, but then you remember the IKEA bookshelf project that’s been sitting off to the side for so long you’ve started to tell your friends that it’s really an art project. “It’s SUPPOSED to look like that,” you say confidently, even as the pile of wood and screws in the corner stares back at you, accusingly. Your expert Fixer can help re-energize your entire living room. Whether you need assistance with your furniture assembly, want to hang a large mirror, or experiment with new wall art or shiplap, we’ll spruce up your space, making it feel refreshed and new – and we won’t leave a mess for you to clean up. If you want to make the room seem bigger, we can add a fresh coat of white paint on the walls – or paint a feature wall – which brightens up the space. Want to prep for the upcoming warmer months? We can replace an aging ceiling fan, or replace your air filters for sweet A/C all summer long. And then there’s the bathroom. New towels can be nice, but they won’t markedly improve your day-to-day cleanliness experience like, say, new fixtures for the tub, sink, and shower head. Even a small update can make all the difference. If you’re tired of looking at cracked tiles and you find yourself longingly wishing for new fixtures or an updated vanity without selling a kidney, Fixer is here to help. 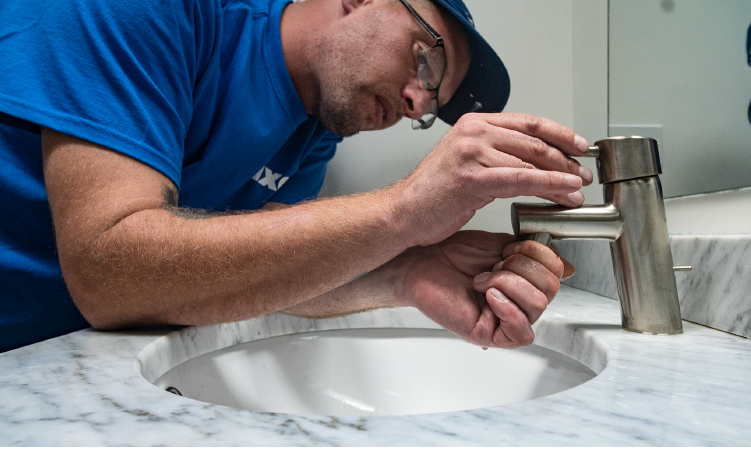 We’ll update your sink and shower fixtures, install a new vanity, replace chipped or cracked tiles, and make sure that tile grout is sparkling clean. Organize and Re-Energize with Fixer! Let us help you fall in love with your space again. By booking a Fixer, you can check those nagging projects off your to-do list - leaving you feeling content, organized, and re-energized and ready to take on anything that comes your way. Older PostWhy Let Fixer Do the Shopping?